The most demanding & the popular tour to Tibet is a 08 days package, where people start their one of the most spectacular overland journey on the 920 km stretch of road, known as the Friendship highway, between Kathmandu & Lhasa and fly back from there. 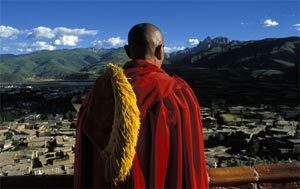 The trip allows a number of detours to the highlights of the Tsang Province and the Lhasa City. The trip offers a spectacular insight into the life and culture of the friendly Tibetan people, from the ancient monasteries with chanting monks, to the tranquil shores of the Turquoise Lake Yamdrok Tso, to the kumbum (literally 100,00 images), the most stunning architectural wonder of Tibet & to the city of wonders, the Lhasa. This trip concludes with the breathtaking Trans-Himalayan flight from Lhasa to Kathmandu. This trip starts early morning at 05:30 am from ADVENTURE SILK ROAD INC office at Thamel opposite KC’s restaurant & before Hotel Excelsior. The distance from Kathmandu to the Friendship Bridge, Kodari (Nepal/Tibet Border) is 116km and takes a 05hrs on drive. After completing immigration formalities on the Nepal side we continue drive / walk to Zhangmu Immigration, which is 09km away. At Zhangmu, our representative from Tibet will meet you and transfers you to the hotel. He will then take care of your entire tour arrangements till your departure from Lhasa to Kathmandu or abroad. The detailed itinerary is as below. Departing at 0530 am from Adventure Silk Road Inc. office, approx. 05 hrs drive along the Arniko Highway, will take us to Kodari (China / Nepal Border). We cross the Friendship Bridge at the border & drive to Zhangmu by jeep (or truck) where after completion of immigration formalities, we will enter to the Chinese Autonomous Region & start the first night in the Tibetan plateau. We will be staying at the hotel/guest house nearby Zhangmu. Overnight at Zhangmu. From Zhangmu, we drive to Lhatse, following the Bhote Koshi River valley with the plenty of waterfalls on our eyes. This route is the most adventurous route among the others as it offers the panoramic views of the high mountains including the highest peak Everest (8848m) with Langtang (7367m), Xixapangma (8012m), Makalu (8464m) Lhotse (8516m), Cho Oyu (8153m). We get chance to pass by the high passes like Nyalam Pass (3750 m), Tong-La (5120m) La Lung-la (5124m) & Gyatso-la (5220 m). We continue our drive passing Tingri (4390 m) & stay at Xegar (also known as New Tingri,). Overnight at Xegar. Transfer to Gongkar airport for the onward breathtaking trans-Himalayan flight to Kathmandu. The one hour & ten minutes flight departing Lhasa at 10 am CST & arriving Kathmandu at 09 am NST offers provides you the chances to see Yarlung Tsangpo River, Lake Yamdrok, Mt. Kanchenjunga (8586m), Mt. Makalu (8463m) and Mt. Everest. (Weather Permitting).An option of flying out to other other popular destinations like Chengdu, Xian, Beijing or to Hongkong is also possible. Or those who wish to explore more the "forbidden city" can stroll the city on their own too. A reservation of the above trip, where you start your journey by taking the flight to Lhasa and end your trip by driving back to Kathmandu also could be organized as the non-scheduled departures.